A legendary disc jockey, Arnie Ginsberg’s unique style made him one of the country’s most influential personalities. With bells, whistles, and sound effects, he put the fun into “Top 40” music. No disc jockey of the ’50s and ’60s was more popular in Boston than Arnie “Woo Woo” Ginsburg. Ginsburg was one of a kind: with his unique voice, self-deprecating personality, and a collection of bells, whistles, and sound effects, his “Night Train” show was not to be missed. 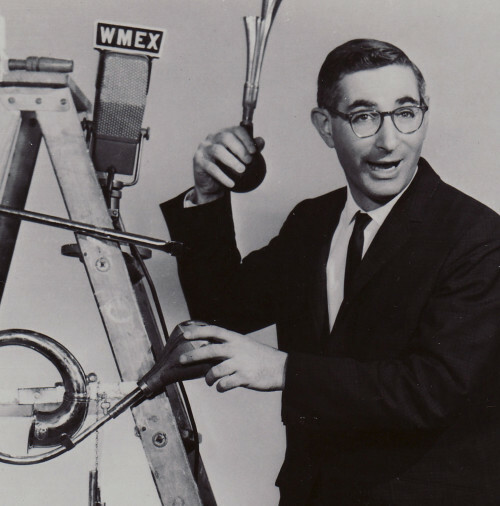 First on WBOS and then continuing on WMEX, Ginsburg put the fun into “Top 40.” He even put humor in the commercials, something not done much in the early ’60s. Whether singing along with the “Adventure Car Hop” jingle or going to his record hops at the Surf in Nantasket, listening to Ginsburg was a major part of many lives.